Right at the start we are welcomed by Le sexe du noyé by Walter Feldmann, which (besides requiring exceptional technical skill) keeps a tight rein on the oboist, even as far as inhaling and minute movements are concerned. 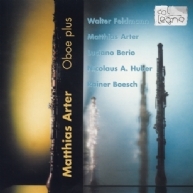 But Matthias Arter does not play the oboe only but also other members of the customary concert instrument's family, like the musette (sopranino oboe) he uses in the last part of his own composition Changes. And he has a lot more to offer even than a great variety of different playing techniques: other parts of the musician's body are brought into play (stamping feet in Nicolaus A. Huber's Vor und Zurück), as well as electronic tape feeds (including ones recorded by Arter himself) and other innovative oboe sounds. And Rainer Boesch's Zweite Erzählung is certainly brought alive by the oboist's improvisational skill, both directly and indirectly via tape feeds, after an intense solo introduction on the oboe d'amore. Luciano Berio's Sequenza VII was another must for this CD (the only piece on the album that is not a first recording, by the way). "A dream of the music of the future:" impressionism, jazz, neoclassicism – and plenty of Antheil are the ingredients of these unique works for piano. Resonance and motion take center stage in Allegro Sostenuto. Lachenmann’s “idea of a musique concrète” bears remarkable fruit in Pression and Dal niente. Helmschrott breathes new life into an ancient, once-popular instrumental form, masterfully leading it in new musical directions with his 12 church sonatas.